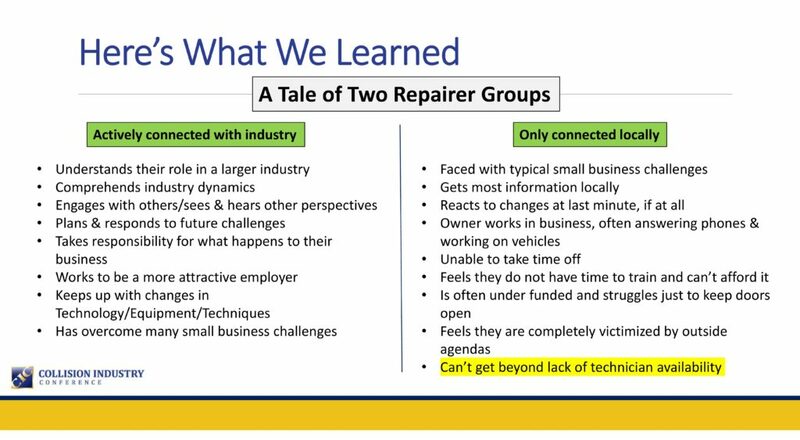 Shops less connected to the industry are paralyzed by the technician shortage and see it as a higher concern than vehicle repairability, based upon a presentation last week from Collision Industry Conference Chairman Jeff Peevy. In preparation for his two-year term running the industry summit, Peevy (Automotive Management Institute) said he talked to 308 shop owners and promoted a CIC survey to less connected shops. Peevy said the collision repair industry appears to be divided into two key groups of facilities. One group was active within the larger industry, keeps up with technology, looks forward and has prevailed over many small business issues, according to a slide he presented. 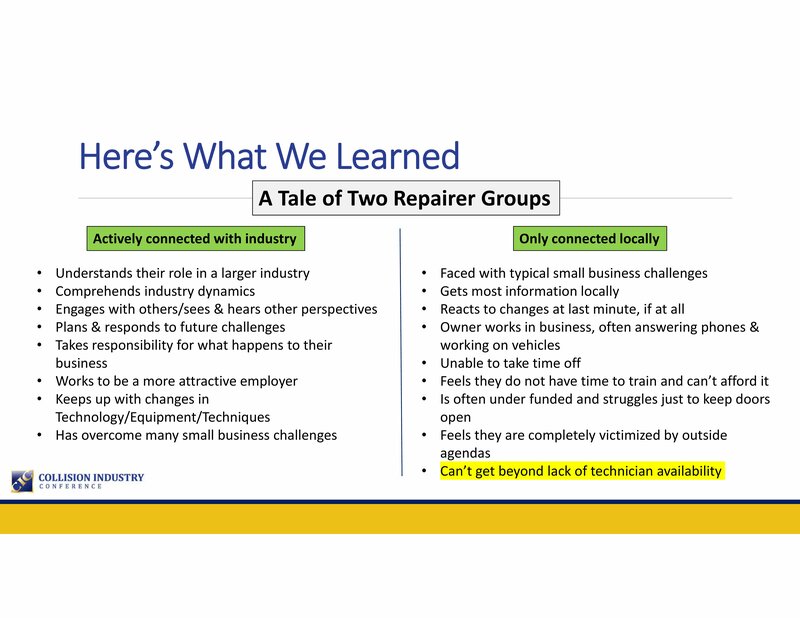 The other is only “connected locally,” is still dealing with common small business issues, finds the owner handling day-to-day work like answering phones or doing the repairs, is reactive, and “Can’t get beyond lack of technician availability,” according to the slide. Peevy said the last of these issues keeps the owners from reaching the next level. Peevy’s efforts to reach out to disconnected shops also saw the tech shortage reflected more intensely in CIC industry survey results. A January 2018 version of the survey drew 117 participants, 36 percent of which were from auto body shops. 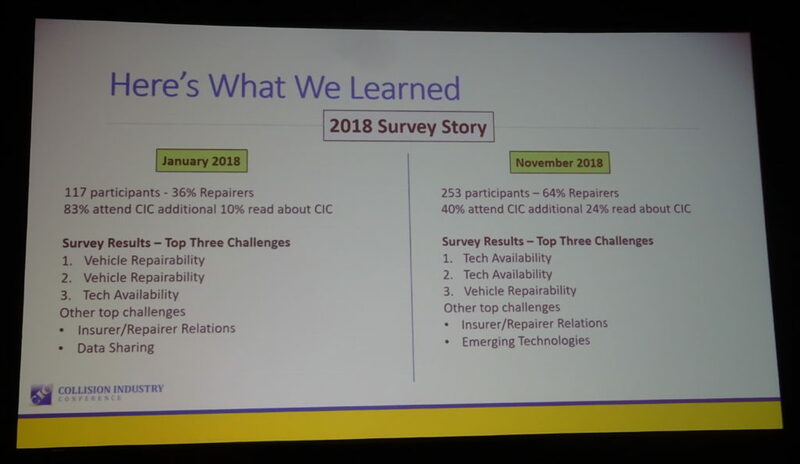 Their Top 2 concerns were vehicle repairability (which probably refers to keeping up with car technology and fixing it correctly, given the conversation at CICs). No. 3 was the tech shortage. Peevy repeated the survey later that year but found largely the same participation and issues. So he sent it out to a broader range of shops who were less connected. This grew the survey to 253 responders, 64 percent of which were collision repairers and a lower proportion of which attended CICs. That survey found technician availability ranking No. 1 and 2, with repairability No. 3. Shops who do rank the technician shortage as their largest concern might want to try a couple of strategies highlighted recently, including at Peevy’s inaugural CIC on Jan. 17. CREF’s lineup includes fairs in Miami, Fla. (Feb. 27); Tampa and Orlando, Fla. (Feb. 28); San Antonio, Texas (March 6); Chicago (March 8); Denver, Colo. (March 29-30); Phoenix, Ariz. (April 6); Atlanta, Ga. (April 28); and Philadelphia, Pa. (May 5). Eckenrode also said Houston and Dallas, Texas, events were also planned within the next 90 days. Anyone interested in participating, contact Eckenrode at 312-231-0258 or by email. Fairs are averaging about 500 students, Eckenrode said. Asked about pricing for the various career fairs, Eckenrode provided a flyer for the Tampa/Orlando event, which will be held at Hillsborough Community College in Tampa. The lowest tier was $1,000, which buys a shop (or anyone else that could tap a workforce of such students) a table at the fair and a copy of the student resume registration list. 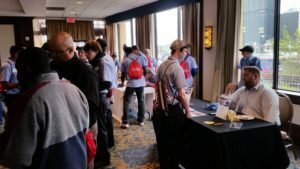 CREF also is allowing six companies to be supporting sponsors for $3,000, which buys you everything at the base level plus your logo on the sleeve of the work shirts given to each students and the ability to host your own student breakout session. One company will be permitted to be the lead sponsor, which buys everything at the $3,000 tier but moves your logo to the front of the shirt. If a shop in any of these areas is dying for techs, it might be a pretty good bet to at least get a table. Eckenrode says the figure he’s heard is that a technician can be worth tens of thousands of dollars in sales monthly given the shop’s increased capacity. For $1,000, it might be a good bet, even for a small shop — after all, a smaller facility might only need to convince one or two kids out of 500 to hit their staffing needs; those aren’t bad odds. The Denver career fair should be particularly fun for participating shops, for Eckenrode announced it will be on the floor of the Denver Auto Show. CREF collaborated with the Colorado Auto Dealers Association and worked out a deal where each organization would get 20 slots at the job fair. The lowest pricing tier is $1,500. “Partnering with CREF was an opportunity for CADA to offer Colorado’s tech students additional career choices,” CADA marketing and communications director Kim Jackson said in a statement Wednesday. She called new car dealers “painfully aware” of their own tech shortages. Snagging one of the CREF slots at the Denver Auto Show should yield additional recruiting opportunity. CREF will bring its own flock of students, but exhibitors will also have a crack at pursuing other auto enthusiasts and convincing parents and kids to choose collision as a profession. The Denver Auto Show reports that 49 percent of its audience are “car fanatics,” and 22 percent attend annually. It’s 67 percent male and 33 percent female (a demographic which might have been overlooked as a source of techs). Eighteen percent of the attendees are 18-24, and another 4 percent are younger than 18; definitely the kind of demographics to target to fill jobs now or in the next few years. 58 percent are between 25 and 54, which would yield the parents you need to convince that the skilled trades are a good career. 23 percentage points of that bloc are 25-34 years old, relatively new enough in their careers (or without a clear direction at all) and potentially swayed into a collision job. Non-Colorado shops might have a chance at such an event as well, for Eckenrode said CREF has received feedback from other organizations about their auto shows as well. Count yourself lucky career fairs exist at all. According to Eckenrode, not a lot of organizations like CREF exist in other technical trades. In fact, he said other “outside-industry types of companies” attending events trying to “take our students.” A cruise line came to a CREF career fair in New York because CREF is basically the only entity holding such events, Eckenrode said. Peevy said CIC also plans to bring collision repair students to the Nashville forum on April 18 and present them with the industry, its opportunities and the concept of CIC. He said the event will also present the students with scholarships from the OEM Collision Repair Roundtable. Anyone interested in supporting or sponsoring this should contact him. I-CAR also in its January Collision Reporter magazine offered guidance which could help with both recruiting and retention: Train employees. It promoted its unlimited training subscription available for Gold Class shops this year. A nine-tech shop would pay $327 a month but be able to train anyone else employed at the shop for free too, according to I-CAR and the publication. MSO business development principal Doug Schlueter, who works with 30 chains nationwide, told Collision Reporter that shops which train have been able to fend off employee poachers. In general, people leave their jobs because they don’t like their boss, don’t see opportunities for promotion or growth, or are offered a better gig (and often higher pay); these reasons have held steady for years. Working with our People Analytics team, we crunched our survey data to predict who would stay or leave in the next six months, and in the process we learned something interesting about those who eventually stayed. They found their work enjoyable 31% more often, used their strengths 33% more often, and expressed 37% more confidence that they were gaining the skills and experiences they need to develop their careers. Schlueter told Collision Reporter that an I-CAR 2012 white paper studying 28 shops also found training cut turnover.